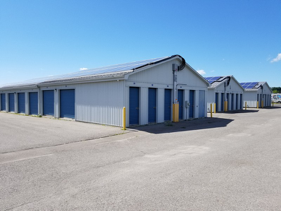 When you need convenient, affordable self storage in greater Toronto and its surrounding areas, like Cambone and Grafton, you need Storage City in Cobourg. In this Secure Self Storage partner facility, you’ll find the right solution for your needs—for short- and long-term storage for items big and small. Looking for a safe place to keep business files? Try our 5’ X 5’, 25 sq. ft. unit. Need to pack up a four-bedroom home? Our 10’ X 30’, 300 sq. ft. unit is the perfect answer. Have a storage need that falls somewhere in between? We can meet it! With standard and drive-up units, a complimentary moving truck, RV and vehicle parking, and a packing supplies store, finding the perfect home for your belongings has never been easier. Our facility is outfitted with state-of-the-art security systems, including 24-hour surveillance cameras, gates, and fences, to protect what matters most to you. Are you ready to store with confidence in Cobourg? Visit Storage City on Veronica St. and learn more about our services today.